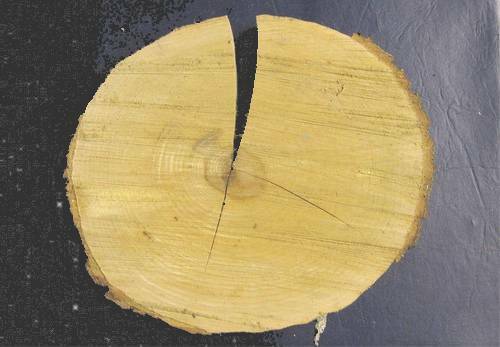 Some plate tuning methods call for accurate measurements of wood moisture content. One way to determine the moisture content of wood in your workshop is through lookup tables of relative air humidity levels and temperature, like this one. Note however that wood takes a while to adjust to relative humidity changes in the air. Digital hygrometers are readily available, generally with accuracies of +/- 2%. These read humidity almost instantaneously. But you can create a serviceable relative humidity meter can be made from wood. Wood expands and shrinks with variations in relative humidity, and expands at different rates in different grain directions. By using the different relative shrinkage and expansion rates, you can make a hygrometer from wood in the same way a bimetallic strip measures temperature. For example see this picture from my friend Mathias who did measurements on various wood species and grain directions in his workshop in Ottawa. The picture on right demonstrates that wood shrinks most tangentially. Axially (in the up-down direction as the tree grows) the variation in shrinkage and expansion is smallest. By combining these we can make a hygrometer. The hygrometer is made by selecting two hardwood strips, one cut axially-along the grain, and one cut tangentially or across the trunk of the tree, also known as slab cut). The diagram on the left illustrates this. These two pieces, or segments of pieces if long pieces aren’t available, are glued together. The relative humidity when the pieces are glued will determine the point where the hygrometer will be straight. Likewise, a water based glue can be used, but this will increase the moisture in the wood and cause the midpoint to be offset. To avoid this epoxy can be used. The sensitivity of the hygrometer will be determined by the thickness of the pieces glued together and the length hygrometer. In my experience a long hygrometer (75cm) of about 3.3mm total thickness moves about 8.5mm per % change in relative humidity. The hygrometer needs to absorb moisture so it’s ill advised to put a protective coating over the hygrometer. Analyne dyes are a good alternative to color the hygrometer.